The pumping beats of house music take the edge off the fact that I finished work 30 minutes ago and now I’m in a warehouse on Industrial Ave. A red carpet with fancy gold edges is sprawled out the length of the main room. People sit and trade cards at circular tables. At the end of the hall there’s a tall, pink, furry box with a hole in it. Small art cards in delicate glass frames hang along the walls. This is the atmosphere at the 10th annual, and final, Carded! “Carded! 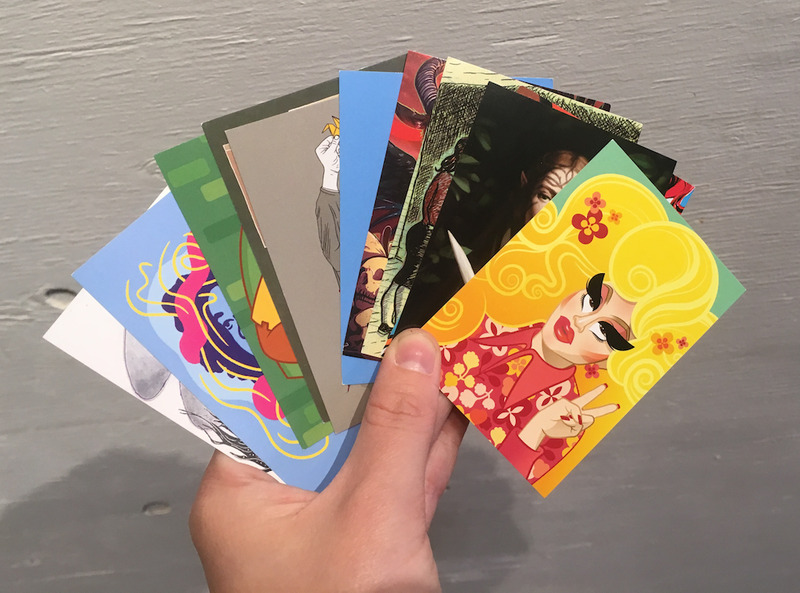 is an interactive art party where people buy, collect and trade artists' work reproduced on trading cards,” says Chris Bentzen, co-founder of the event. He stands next to the other founder, Jim Hoehnle, who is selling the cards out of the furry box. Each pack is five dollars and comes with five small pieces of printed artwork. I bought two packs of cards, and started with a lot of art that I liked and a few that I could trade. I was nervous, only because I thought the event may bring up flashbacks of trading iron-on patches at Girl Guide camp. However, my nervousness quickly subsided when the first person I talked had the exact card I wanted. There were people of all ages at the show, from children running all around the red carpet to baby-boomers trading with Emily Carr students. Asking people to trade was easier than I thought it was going to be, mostly because it was sort of the whole point of the event. During conversations mid-trade, it became clear that the crowd was sad that Carded! had come to an end. The common theme amongst patrons was that the event series had been a really great way to meet people and a very accessible way to enjoy and buy art.